My childhood dream to play pro football on TV seemed far-fetched, if not impossible. I had worn leg braces to bed as a toddler and was so skinny entering high school my freshman football coach called me ‘Broom-stick.’ Then when I got kicked off the team after a scrape with the law two years later my dream looked hopeless. 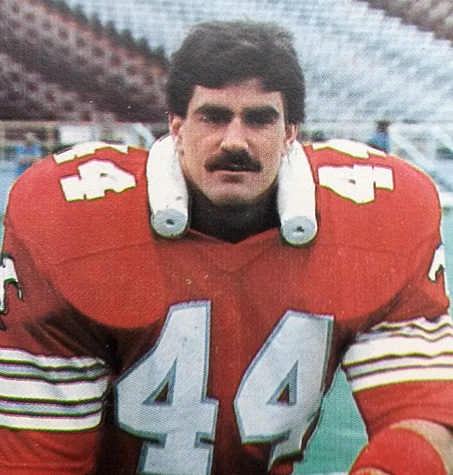 But there I was in the summer of ’82, playing middle linebacker for the Montreal Alouettes of the CFL – with and against star players like Warren Moon, Billy ‘White Shoes’ Johnson, Vince Ferragamo and David Overstreet – on TV sets all across America, thanks to the NFL players strike that year. Even got interviewed as Defensive Player of the Game after televised games in Saskatchewan and Toronto. The next year I signed with the Super Bowl champion Washington Redskins, led by coach Joe Gibbs, quarterback Joe Theismann, John Riggins and their offensive linemen known as The Hogs. Although I didn’t make that talented team, the experience capped three years of living my dream – and proved I had learned important keys to overcoming obstacles and achieving success. Now a greater dream was crystalizing in my spirit; to help others harness those keys to realize their dreams! My first move was a book project I discussed with Joe Theismann called, The Whole Nine Yards: Your game plan for ultimate success. He would share his insights and sizzle and I would do the writing and add a few of my experiences. Unfortunately, Joe was too busy and I couldn’t do it on my own. So that project died on the vine. But my dream wouldn’t die. It got buried, like a seed lying fallow yet developing quietly under ground as I coached teams, built companies and served as a church pastor. And it continued to develop as I studied high-impact people in-person and throughout history, even as I worked in real estate and remodeling businesses. Finally my dream surfaced again, now with years of pent up energy and growth, and demanded my immediate attention. And so last year I funneled what I know into the book, Personal Convergence: How everything about you meets for maximum impact. That book reveals 7 little-known Keys behind David’s famous ‘Bull’s-eye!’ victory over Goliath and explains how they apply to our lives, as well. Now I’m launching the 7 Keys to your success video series to help people harness their personal histories, dreams and DNA to achieve maximum impact. I invite you to take a sneak-peak at the introductory video during this precious time of year when you can pause and reflect about your own goals, plans and ultimate dreams. I believe you will gain divine perspective and great enthusiasm for your year and life ahead – and will also learn how to help others do the same. So Happy New Year and God bless you, it’s time to make your dreams come true!